A twist on a classic for the entire family! 2. Prepare quinoa according to packaging instructions. Drain any excess liquid. Reserve. 3. In a food processor, add oatmeal, process till fine. Sift and return to processor, adding the cauliflower rice, quinoa, garlic, vegetable oil, onion, 1/2 cup of the chopped basil, Italian seasoning, red pepper, salt and pepper. With processor running, gradually pour in egg whites. Process until smooth. Reserve. 4. Line a 13x18 baking sheet with foil and coat with non-stick spray. 5. Avoiding the corners and sides, evenly spread cauliflower mixture on to baking sheet and poke mixture with a fork. Bake for 15 minutes on the lowest shelf. 6. Carefully flip baked crust onto a cooling rack. Place cooling rack with pizza back onto the baking sheet. The bottom of the pizza should now be the top. Return to oven for 10 minutes or until golden brown. 7. Toss tomatoes, mushrooms, red onion and peppers with Italian seasoning, zest of one lemon, juice and cooking spray. Roast until tomatoes are blistered. Reserve. 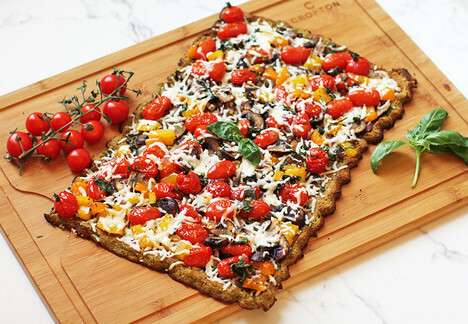 Top pizza with roasted vegetables and cheese. Return to the oven and bake for 5 minutes or until cheese is melted. Top with remaining 1/2 cup of basil and zest of remaining lemon.